Baker's pizza: Pizza made with bread dough and tomato sauce. Kugelhof for Nanou: Traditionnal Alsatian cake. Panettone: Italian brioche-style sweet loaf with dried and candied fruit. Brioche dough: Just like from the baker's. Pizza dough: For homemade pizzas. 3-fruit brioche loaf: Layers of different dried fruit in a rectangular brioche. 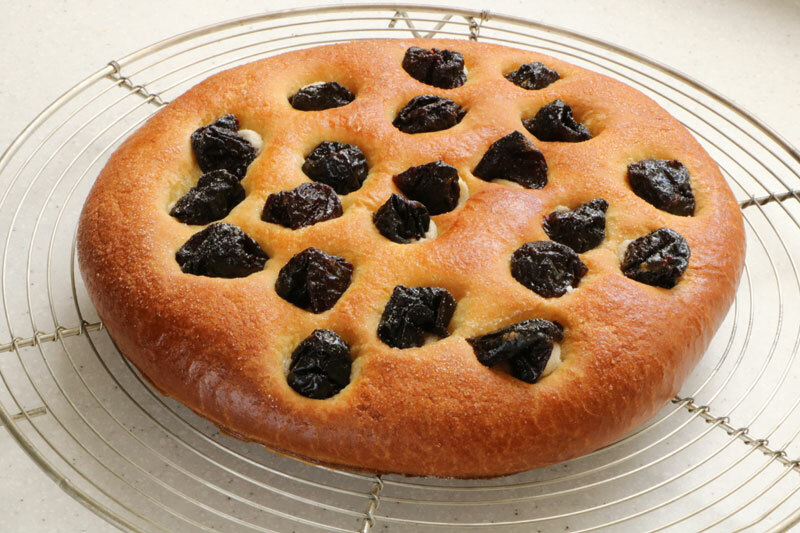 Agen prune cake: Brioche-style cake with Armagnac marzipan and prunes. 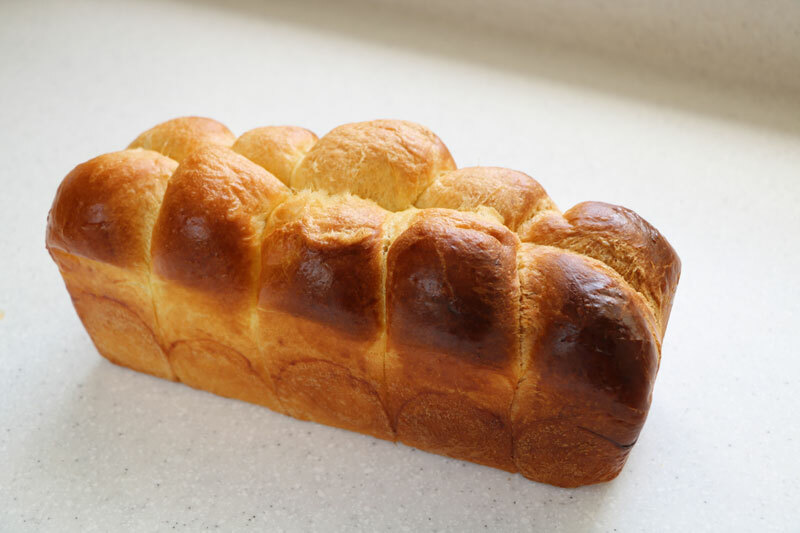 Brioche feuilletée (flaky brioche): Brioche dough treated like puff pastry. Chocolate rolls (petits pains): Real chocolate rolls. 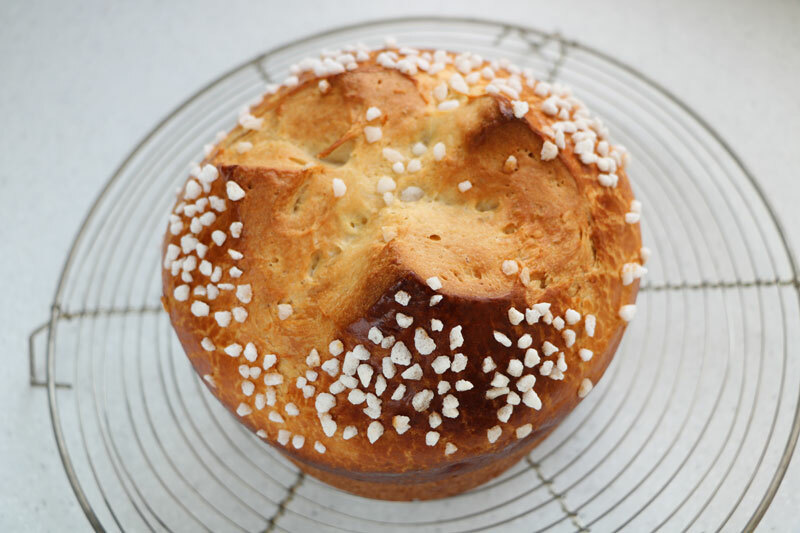 Cramique: Brioche-style loaf with raisins and pearl sugar. Flaky brownie brioche: Flaky brioche with butter, chocolate, brown sugar and toasted pecan nuts. Flaky chocolate brioche: Flaky brioche rolled around chocolate filling (can also be plaited). French croissants: The most famous viennoiseries. Galette de Fougerolles: Brioche-style flat cake with hazelnuts, topped with craquelin and griottine cherries. Milk rolls: Soft sweet bread with butter and milk. Mini apricot and pistachio brioches: Double pistachios brioches with dry apricots. Mouna: Brioche with Mediterranean roots, flavoured with citrus fruits and orange-flower water. 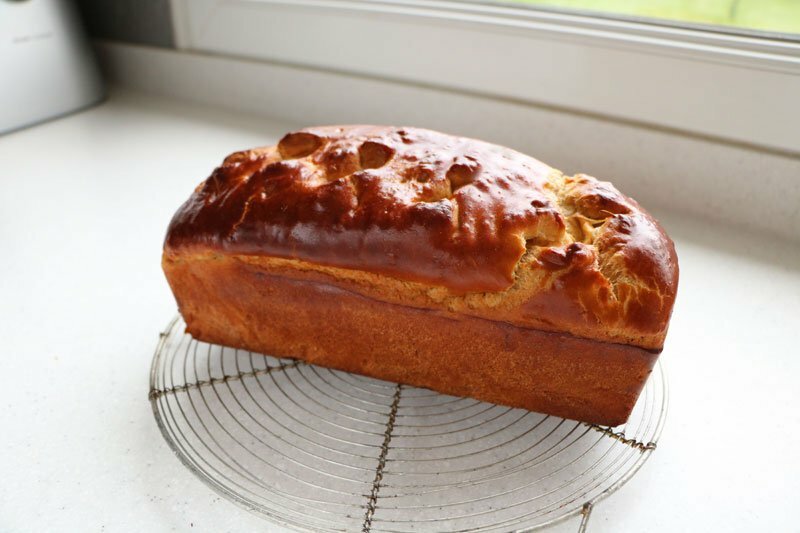 Nanterre brioche: Brioche like from the baker's. Nantes Tourton: Halfway between brtead and brioche, a sweet loaf without egg. Old style brioche: Brioche with a slight taste of leaven. Pains briochés aux raisins: A brioche dough roll with confectioner's custard and rum-soaked raisins. Pogne de Romans: Traditional brioche with orange flavour. Pretzels: Soft bread in a knot topped with salt or poppy seeds. Rolled chestnut and apple brioche: Brioche made with a mix of plain wheat and chestnut flour, then rolled up with butterscotch apples. Tomato sauce for pizzas: A tomato sauce with herbs. Mixed seed grissini: Litlle crusty bread sticks. Classic French white bread: Yeast-raised bread. 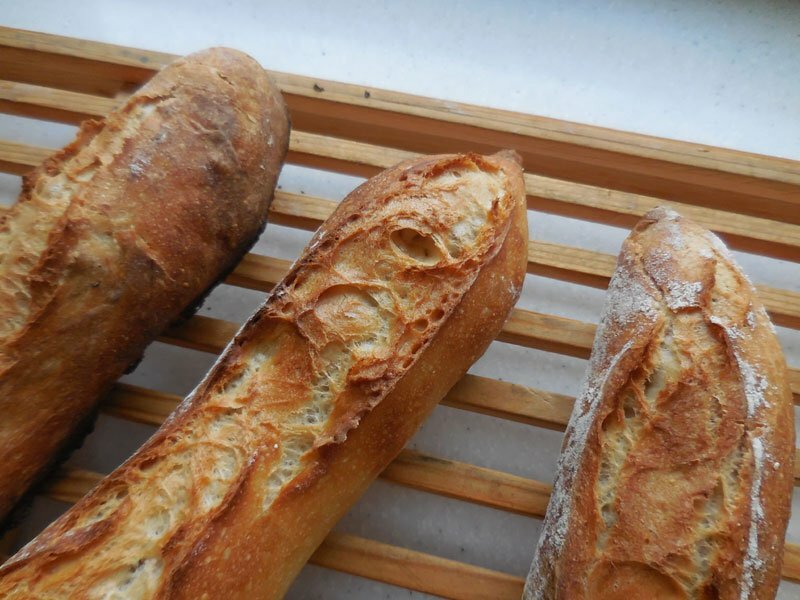 French baguettes: Crunchy crust and light crumb. Leavened bread: The real taste of bread. Natural leaven: The leaven of ancient times. New leavened bread: A softer leavened bread. Ocean bread: Bread made with sea water, with no added extra salt. Sandwich bread: For sandwiches, toast and canapés. Surprise bread: Little sandwiches in a big loaf. Tomato foccacia: Foccacia with green olives, preserved tomatoes and parmesan. "Psychedelic" sandwich bread: Sandwich bread with two different flavours rolled together: turmeric and squid ink. Ali Baba bread: Bread with a triple dose of sesame. Aperitif rolls: Soft, bite-sized bread rolls. 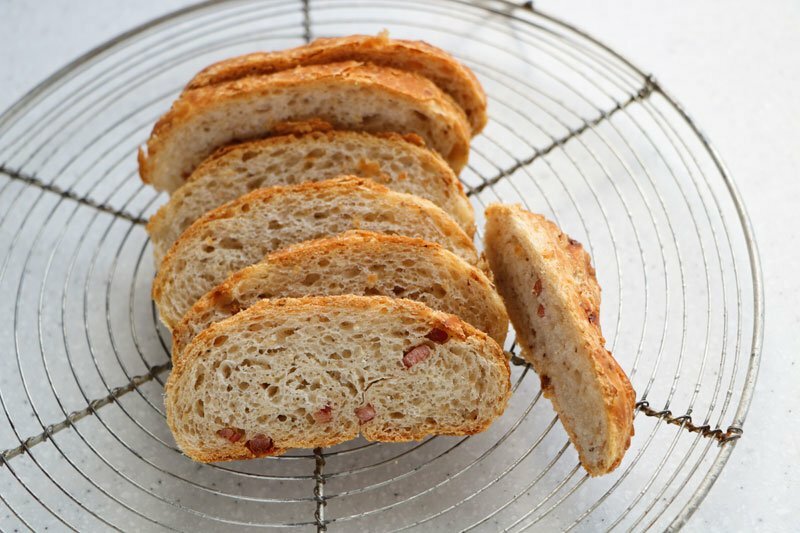 Bacon rolls: Flaky bread rolls with bacon bits and sesame seeds, layered with lard. Benoîton: Small, rectangular wheat-rye bread with raisins and almonds. Ciabatta: Small soft Italian breads. Cretan Bread: Soft bread with olives, feta, onion and preserved tomatoes. Dipping bread with cheese: Soft bread flavoured with shallots and bacon, made as loaf of mini-rolls for dipping in melted Mont d'Or cheese. Franche-Comté sticks: Thin baguettes with cheese and smoked sausage. Jura bread: Bread enriched with walnuts and Comté cheese, made using Jura wine instead of water. Loaf for "les filles'": Loaf in 3 colours: white, red and green, and their 3 flavours: onion, pesto and olive, tomato. Mustard baps: Baps with double mustard flavour: seeds and dough. 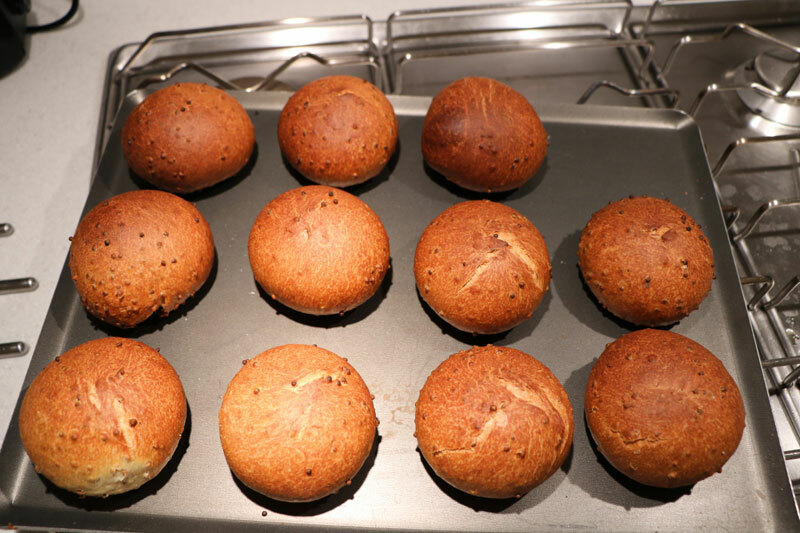 New hamburger buns: Soft rolls with a hint of brioche. Olive and pesto bread: Two slabs of foccacia dough with a layer of pesto in the middle and green olives embedded in the top. Peanut rolls: Double peanut bread rolls: chopped nuts and peanut butter. Poitevin twist: Like a short baguette but twisted, filled with diced goat's cheese and toasted walnuts. 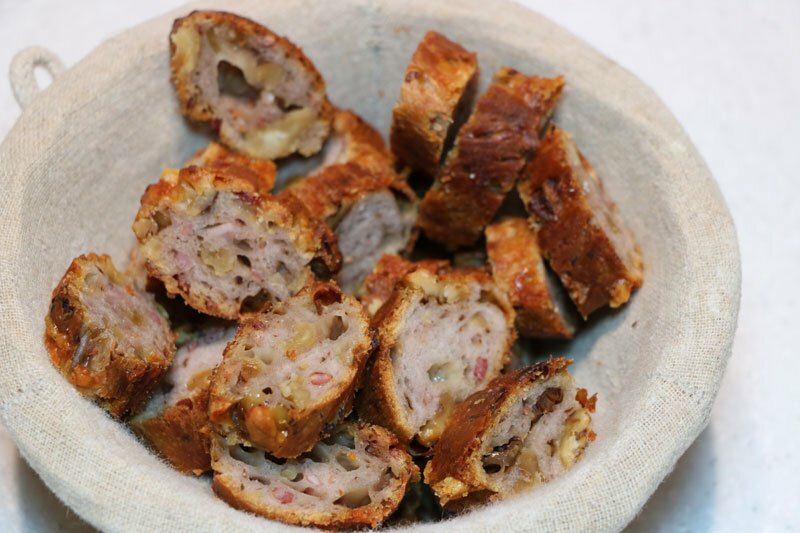 Roscoff loaf: Bread enriched with onions soaked in red wine, and smoked sausages. Saucipain: Bread made with red wine, salami and toasted pistachios. Seeded loaf: French baguette dough with a mix of dry-roasted seeds. Special Parmesan baguettes: Bread with Parmesan, fried onions and mushrooms. Special small breads: Many kind of small breads. Spring Bread: Bread with Parmesan, preserved tomatoes and chive flowers. Two-olive ciabatta: Light Italian bread with olives. 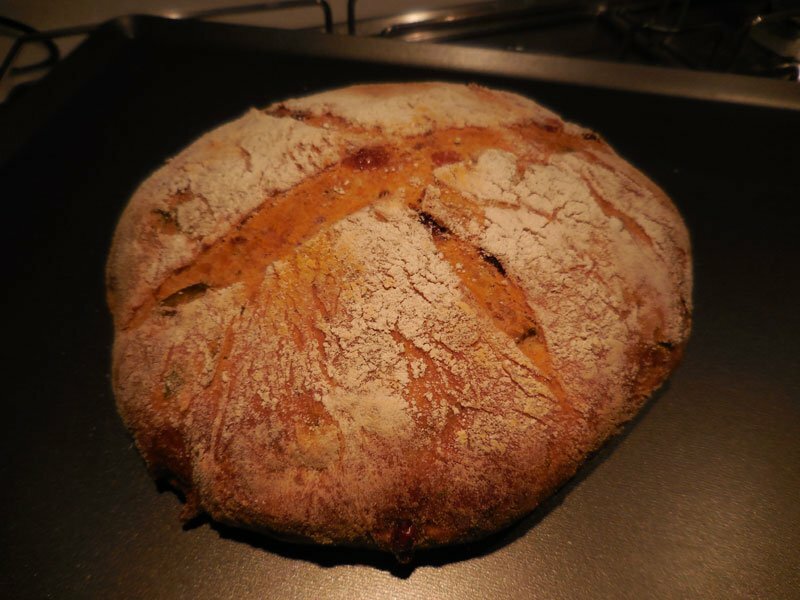 Fougasse with bacon and Comté: Rich Mediterranean bread. Lumberjack turnovers: Round stuffed bread with bacon, mushrooms and cheese. Preserved tomatoes: Slow-cooked tomato "petals". Sausage in brioche: Smoked sausage baked in a brioche.